Ages 5 through 8. Stimulate the development of receptive and expressive language skills as children play high interest language games. The games can be used to stimulate the development of auditory processing, grammar, vocabulary, problem-solving, and pragmatic communication skills. Reproducible playing boards, pictures, and task cards are included for games that require the use of visual stimuli. The book also includes competitive listening games. All stimuli for these language processing games are presented orally. Comprehensive lists of task items are included for individual games so that you can customize the activities to meet the needs of your students. Win the GOLD Board Games. Each of the 25 game activities in this section includes a reproducible game board and playing cards. The games target vocabulary, categorization skills, verb tenses, descriptive language skills, verbal problem solving, and other skills. Word and Category Bingo. The bingo games in this section build basic vocabulary skills as students name pictures and categorize words. Following each correct response, the student places a token on the bingo board. Vocabulary Tic-Tac-Toe. Students take turns naming nouns and placing them in categories as they play this popular game. Let's Compare. The games in this section challenge students to identify and describe similarities and differences in groups of four pictures that are almost identical. Team Challenge. 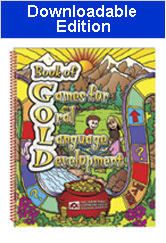 The games in this section target vocabulary, grammar, and knowledge of parts of speech. Students are divided into teams for these interactive games. This product is a small PDF file that you can download. If you are unable to open the sample pages in this ad, you need to obtain Adobe Reader before using the file. Adobe Reader is available FREE at http://www.adobe.com/. This product can also be ordered in a bound book or CD format. There is no shipping/handling charge on this item.